The first in the list of the best universities is the Moscow State University named after M.V.Lomonosov. Lomonosov Moscow State University was founded in 1755, it is one of the oldest and largest universities in Russia with more than 40,000 bachelor and master students. Most of the faculties are located 5 km from the center of Moscow on the Vorobyovy Gory, where opens a stunning view of the Moscow River. Moscow State University Lomonosov takes a honorable third place in the rating of QS University Rankings: BRICS. It scored most points on many of the eight criteria, namely for academic reputation, the ratio of teachers and students, the reputation of employers, the number of international students and the number of employees with a Ph.D. in Philosophy. It is called the oldest university in Russia. The history of the St. Petersburg State University begins with the St. Petersburg Academy of Sciences, founded in 1725. With 32,000 students and 20 faculties, it is inferior in size in comparison to the Lomonosov Moscow State University. It offers an impressive range of cultural and sports facilities, located in close proximity to the main sights of St. Petersburg. The educational institution itself is located on Vasilievsky Island, which is equipped with a metro and tram lines. St. Petersburg State University takes the 14th place in the rating of QS University Rankings: BRICS and in principle its strengths and weaknesses in many respects are repeated by Lomonosov Moscow State University. Lomonosov Moscow State University. The University received high scores for the ratio of teachers and students, an international reputation among professors, the proportion of staff with a Ph.D. in Philosophy and for the number of international students. A relatively young school. The University was founded in 1959. Located 20 km from Novosibirsk, the third largest city in Russia after Moscow and St. Petersburg. The university offers courses of lectures on a wide range of subjects of a scientific orientation. Novosibirsk State University takes the 22nd place in the ranking of QS University Rankings: BRICS, having received the highest scores for the number of foreign students and the ratio of teachers and students. The next in the BRICS ranking Russia is represented by the Moscow State Technical University named after N.E. Bauman. One of the oldest universities, which is also the largest technical university, has 20,000 students, including candidates for the degree of Doctor of Philosophy. The educational institution offers a wide choice of courses of lectures on engineering and applied sciences. Like other leading universities in Russia, the Moscow State Technical University named after N.E. Bauman is distinguished by a high score in the ranking for the ratio of teachers and students and ranks 4 th among the universities of the BRICS countries in this indicator. Another advantage of the university is the demand for graduates among employers, which is proved by the research of Quacquarelli Symonds. Once Moscow State Institute of International Relations (MGIMO) was part of the Moscow State University, but in 1944 became an independent educational institution. The number of applicants is approximately 6,000 students to bachelor and master's levels. Based on the name of the institution, it becomes clear that the university has a humanitarian orientation and specializes in diplomacy, journalism and law, and also boasts a wide choice of languages. Moscow State Institute of International Relations is ranked 37th in the QS University Rankings: BRICS ranking and received high scores for the ratio of teachers and students, and also has a high rating in international surveys. Impressive assessments the university received for the percentage of employees with the title of Doctor of Philosophy and for the number of foreign applicants - on the above indicators it ranks 3rd and 12th among the educational institutions of the BRICS countries. Many Russian names aren't Russian in origin. They were adopted from the Greek language as well as the Christian religion. 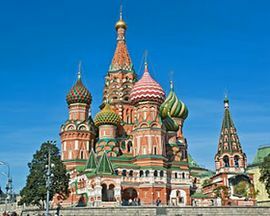 All the old Russian names were gradually displaced by church names which came to Russia from Byzantium with the introduction of Christianity. Old Russian names were entirely forgotten in the XVIII-XIX centuries, and Christian names considerably changed their face to accomodate the features of Russian pronunciation. It's a list of old (Russian calendar, old Russian and Common Slaviс) interesting Russian girl names. The name Bazhena relates to an array of old Russian names. The name originated as a female form from the male name Bazhen which means "ardently desired and warm-hearted". This name goes back to the old Russian word "bazhenie". In other words "desire, mercy, and compassion".